It was a privilege to be invited to sing for an hour at the Open Day of the Christchurch Town Hall. Our colourful costumes evoked colour harmony of the organ pipes at the top. Sweet Adelines International was founded in Tulsa Oklahoma in 1945 and is now one of the world’s largest singing organizations for women with 22,000 members in 500 choruses worldwide. Christchurch WOWS the judges and does it again!! As the newly-crowned national Sweet-Adelines champion, Christchurch City Chorus will represent New Zealand at the Sweet Adelines International competition in New Orleans in 2019. 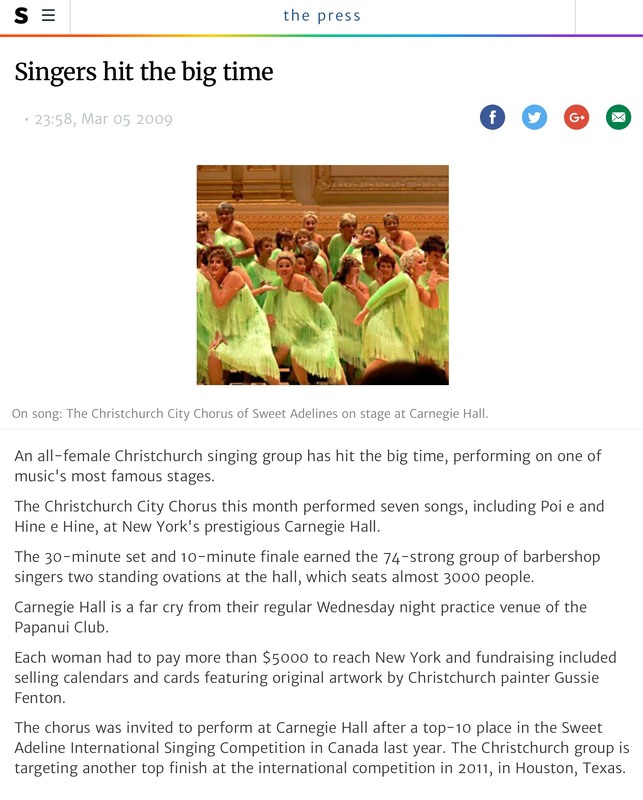 Winning is now second nature for the Christchurch City Chorus, which took home the national Sweet Adelines competition title for the 11th time. Christchurch WOWS the judges and does it again!! What an amazing time we had at our show on Saturday! Sweet Adelines is the best way to describe the 110 members of the Christchurch City Chorus, who just love to get stuck into a catchy tune. An all-female Christchurch singing grouphas hit the big time, performingon one of music's most famous stages. Christchurch City Chorus love to perform and show off our talents. We will deliver an excellent quality performance tailored to your specific Christmas function, weddings, birthdays, Mother’s Day, Valentine’s Day, memorial day services and funerals. We also do corporate function, prize giving, private or community events. Prices will vary according to the type and duration of the performance, size of performance group, specific programme requests, and other variables. Each year the chorus undertakes a number of low cost, no cost or payment by donation performances as a community service to non-profit organisations and charities. Contact our Performance Coordinator to discuss dates and times, number of performers, the programme and audience, and the venue. Our Vision: Striving for musical excellence, consistently performing at A level, empowered by musical leaders and sharing achievements with like-minded members who love to perform at their very best.